Now an accomplished fashion photographer, Thomas Schenk, born in Illinois and raised in New Jersey, oriented himself toward photography at 26 years old. Even though he had a very early interest in fashion (he created outfits as a child for his sister) and admired the works of designers such as Jean-Paul Gaultier and Vivienne Westwood in the 80’s, he attended the art school of Philadelphia College of Art where he studied ceramics and print-making. Aside from his studies, he had a passion for riding show horses and spent much time on this hobby. Even though one of his friends was a make-up artist and that led him to "do little things together" he never considered photography as a career path at the time. In the late 80’s, a friend of his finally convinced him to follow him in Amsterdam to meet someone involved in a new magazine, Dutch. There, he found his first agent and began to work for the magazine and various publications. A self-taught photographer, he confesses that he’s not very much into fine arts and doesn’t take inspiration in other sources apart from fashion. He then could be considered as quite an instinctive artist. "What I’m trying to do is keep it really simple, see who the girl is, see what the clothes are, and create a look that will maybe be a little more interesting. I don’t feel like having a big scenario to hide things. What you’re seeing is the girl and the clothes – that’s it" he said in an interview for Tear Sheet Magazine in 2002. In 2001, he worked with Tori and make-up artist Kevyn Aucoin on the Strange Little Girls visuals. 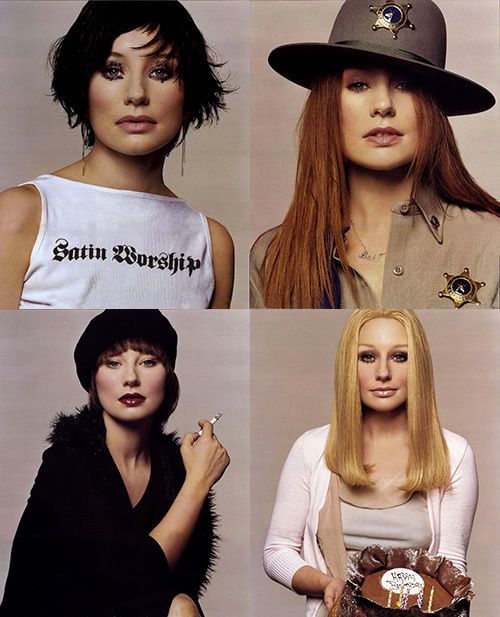 After Tori had created each of the thirteen female characters behind the cover songs of the album with her close friend, comics and fantasy author Neil Gaiman, Kevyn Aucoin and her created the looks for each girl and Thomas Schenk took the stunning pictures showing Tori as these different women, each photograph being a minimalist portrait in front of a creamy white background, very much inspired by the work of Cindy Sherman.